The Russian Navy has decided to recommission the unique Barracuda submarine (Project 945), whose hull is made of titanium. Titanium subs were first built in the 1980s, since they are more durable and do not attract magnetic mines. But because the cost of titanium is several times higher than that of steel, the construction of titanium submarines was put on hold after the collapse of the Soviet Union. A high-ranking source in the Russian Navy Command told Izvestia that the decision to revive the Barracuda was taken in January at a meeting with Navy Commander-in-Chief Viktor Chirkov. "It was not a spontaneous decision, we carefully considered all aspects and concluded that restoring the submarine would be more cost-effective than scrapping it," he explained. 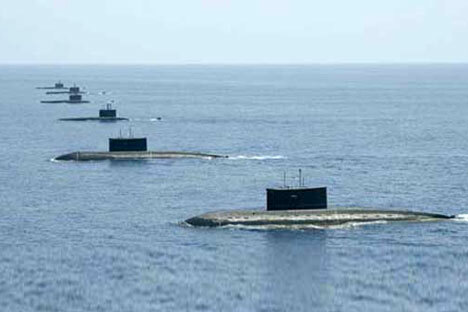 The Navy presently has four titanium nuclear submarines in service (excluding mini-submarines for deep-sea research): two Barracudas, the K-239 Karp, and the K-276Kostroma, plus two titanium subs modernized under the Condor program (Project 945A) — the K-336 Pskov and the K-534 Nizhny Novgorod. The main targets of the Barracuda and Condor are aircraft carriers and other submarines, which can be destroyed by torpedoes fired from two 650-mm and four 533-mm launchers. In contrast to the Barracuda, the Condor can fire Granat nuclear cruise missiles and plunge to a depth of 600 meters, instead of 550. The vessels can defend against air attack with Igla anti-aircraft missiles. All the boats are part of the 7th Submarine Division of the Northern Fleet (based at Vidyaevo), but since 1994 the Karp has been stationed at the Zvezdochka dockyard, awaiting maintenance. A contract for the renovation of the first two submarines was signed with Zvezdochka. Under the arrangement, the plant is due to combine standard repair work with modernization. Izvestia was informed by a top manager at Zvezdochka that all nuclear fuel and electronics on board the vessels will be replaced and the mechanical parts inspected and repaired. Maintenance of the nuclear reactors will also be carried out. "According to the schedule, by late April the K-239 Karp could be transferred from the fleet's list of assets to the plant's. By that time, all diagnosis and troubleshooting should be complete and the work schedule approved. Maintenance work is due to begin this summer and last for 2-3 years, in the best-case scenario. It is possible that the time frame could be extended, since the situation regarding suppliers is not clear. After the Karp, next up for repair will be the Kostroma,” said a Zvezdochka spokesman, adding that, despite its age, the titanium hull was "in excellent condition." "Unlike steel, titanium does not corrode, so if you remove the noise-absorbing rubber coating, the body underneath is as good as new," explained a repair worker. According to preliminary data, the titanium subs will be fitted with new hydroacoustic stations, combat information and control systems, reconnaissance radar, and a GLONASS/GPS navigation system. In addition, the boats will have upgraded weapons systems with the ability to fire cruise missiles from the Kalibr complex (Club-S), including at ground targets. The durability of titanium submarines was demonstrated in 1992, when the Kostromanuclear submarine collided with the U.S. Los Angeles. The deck cabin of the Russian vessel was slightly damaged, whereas the American boat had to be written off. In an interview with Izvestia, Dmitry Boltenkov, an independent military expert and author of many books on the history of the Russian Navy, described the atomic titanium-body submarine as a "national treasure." "The restoration of the fleet's multipurpose nuclear submarines is one of its most important programs. Unfortunately, subs make up barely a third of the total number of vessels, so the return of Project 945 is certainly good news. Thanks to the titanium hull, these boats can serve up to 100 years," he said. However, former Navy Chief-of-Staff Victor Kravchenko explained that the decision to restore vessels built in the 1980s was not the most expedient solution. “Modern steel alloys can withstand the same depths as titanium. Therefore, as in Soviet times, titanium has no real advantage over steel. I think it would be better to build new vessels — they would be a greater asset," believes Kravchenko. When repaired, the four nuclear vessels in the 7th Submarine Division of the Northern Fleet are expected to be based at Vidyaevo.